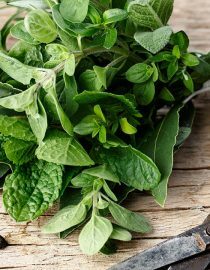 Gout is a very specific type of disorder so using herbs for this condition is a little different than with other disorders. With gout, you need an herb that is going to be very specific and decrease uric acid crystals that are accumulating in the body. If the crystals continue to form, they will build up in the joints and start damaging them. X-rays of joints effected by gout look like joints eaten away by something mysterious. Thus, it’s a race against the clock to decrease the amounts of uric acid before the damage to the joints start. Of course, if the damage just started it may be reversible; however, if the damage has been accumulating for some time, it will take longer. If the damage is quite extensive, you will need even more herbs to make sure you do get a complete recovery. Boldo, an herb noted by American botanist James Duke for the treatment of gout. Boldo stimulates the liver. It contains a medicinal ingredient known as boldine which reduces uric acid levels. Artichoke, a known liver cleanser. Dandelion, which has anti-inflammatory properties, is a diuretic and excretes uric acid. Dandelion is often used in liver cleanse formulas. Burdock root, which is also a diuretic and has anti-inflammatory properties. As you can see, the herbs that are effective for gout work on liver function. It’s the liver’s job (and the kidneys’) to clear the uric acid when levels rise, so when you cleanse the liver cells with herbs, you end up helping the body to eliminate excess uric acid that damages the joints. An herbal formula for gout might potentially contain liver cleansing herbs, kidney cleansing herbs, and anti-inflammatory herbs to decrease any inflammation in the body that is occurring from the condition. Don’t forget that to flush the uric acid out of the body, drinking as much water as you can helps the process along better than if you went without this step. Aim for a goal of one ounce water for every pound of body weight. That means if, for example, you weigh 100 lbs. right now, you will drink 100 oz. (This is 12-1/2 cups). Taking the herbs for at least a week is a good idea since you won’t know the uric acid levels are reduced unless the pain is gone in the joints. Ideally, you can take the herbs until a blood test shows normal uric acid levels. Lanhers, M.C., et al. Hepatoprotective and anti-inflammatory effects of a traditional medicinal plant of Chile, Peumus boldus. Planta Med, 1991; 57(2): 110-115. Levy-Appert-Collin, M.C., et al. Galenic preparations from Peumus boldus leaves (Monimiacea). J Pharm Belg, 1977; 32: 13. Backhouse, N., et al. Anti-inflammatory and antipyretic effects of boldine. Agents Actions 1994; 42(3-4); 114-117.